Crossover fighting games are a time-honored tradition, especially when it comes to various series out of Japan. Bandai Namco Entertainment has a long history pitting the various heroes and villains of the Shonen Jump manga level against each other, and there’s a stable of developers it often rotates through. Jump Force is the latest effort in that line, this time from Spike Chunsoft. While that studio is more closely associated with RPGs and visual novels, there is precedent here, with the likes of J-Stars and One Piece: Burning Blood both being fighting titles from the developer. While those games were more traditional in various respects, Jump Force tries something… different. Unfortunately, while there are some moments of fun peeking out from around the edges, Jump Force is frankly, a disaster. Here’s the pitch: a pair of villains, original characters designed by Shonen Jump legend Akira Toriyama, are using the power of magic video game space cubes to attack the very fabric of reality. This causes the real world, or this story’s approximation of such, and the worlds of Shonen Jump comics to violently collide. You’ll see this reflected in some pretty cool stages, in which landmarks from the real world such as the Statue of Liberty are sharing space with immediately familiar Shonen Jump iconography. Of course, this also causes literal comic book characters, all of which are hyperreal Japanese manga creations, to cross over as well. 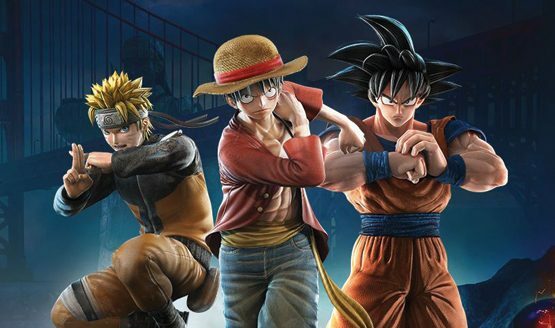 By this logic, says Jump Force, everything needs to look like it’s “real,” including the colorful cast of characters. This is all done using the Unreal Engine, which would probably be fine if it wasn’t for the fact that, well, Jump Force has almost no polish to it. It’s unfair to make assumptions of a game’s development without having actual knowledge of course, but everything about Jump Force feels like the game was rushed out of the building before it was done cooking, down to nearly every aspect of its being. For starters, it’s absolutely hideous to look at. There’s no aesthetic sense here, just bizarre textures and semi-realistic detail smashed on top of character designs that are more akin to Disney than DC Comics. This results in someone like Goku, who normally is a very distinctly stylized and cartoonish character, having not only cloth-like detail on his clothing, but also a sick, glossy sheen to his skin, bulging, alien-like eyes, massive hands, and some seriously grotesque, John Cena-like cutaneous muscle veins. Characters like Izuku Midoriya from the even more stylized works like My Hero Academia, almost look better because of their impossible features, but that only enforces there are no actual aesthetic goals here, only a vague concept that maybe looks okay via YouTube trailers but looks like anime nightmare fuel blown up on a 50+ inch TV screen. And the story content in Jump Force only makes it worse. When in combat, Jump Force looks a lot better thanks to a lot of moving parts, motion blur, special effects, and some pretty dope special move sequences. Meanwhile, during story cutscenes, as little as possible is happening. Characters just stand around and exchange dialogue, barely moving or interacting with each other in any way. The voice acting is just as phoned in (frankly, who can blame the actors? ), so you have moments like Goku and Vegeta not really looking at each other, sort of wiggling their gross Brock Lesnar appendages, and probably having a piece of another character’s costume clipping through their torso from off-screen. You’ve probably seen the clips going around from early access players by now. Regardless of the how or why, Jump Force stumbles from its dumpster fire of a visual style and into derivative mechanics sets lifted almost wholesale from two other—much better—Bandai Namco anime fighting games. Of course, neither function as well as the source material in either case, and you’re better off playing those games instead. Structurally, if you’ve played a Dragon Ball Xenoverse game you will immediately recognize the setup in Jump Force. You create a player avatar, which you can then dress up with various costume unlockables, and kit out with moves available from the normal Shonen Jump roster. From there, you will generally be forced to use this character in one of your team slots throughout the story missions, but as a 3-on-3 game you will still be able to try everyone out at the same time. Meanwhile, the gameplay is strikingly similar to Byking’s My Hero One’s Justice, albeit a very sloppy version of what is actually a thoughtful little Power Stone riff. It’s a simple fighter built around reads, fueled by a rock-paper-scissors sort of system (with the “Quirk” button replaced with a lame duck throw technique). You can do light or heavy combo attacks, a slower guard break attack, or use a throw. If you hold a button, you’ll have access to three different special abilities, and one super once you meet the right conditions. 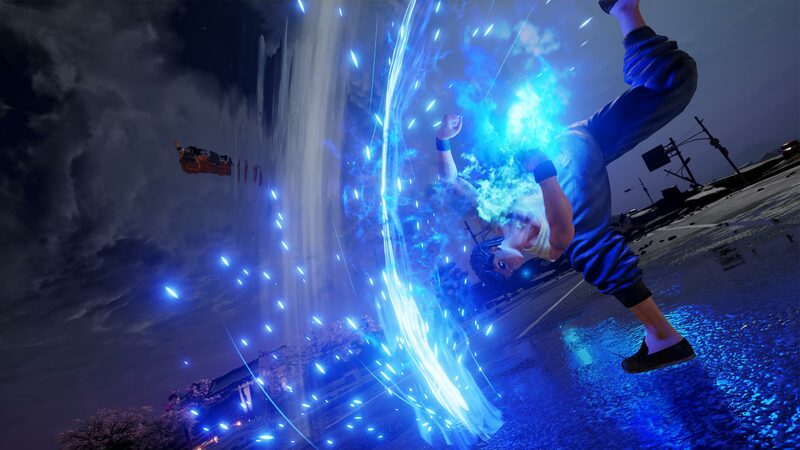 What Jump Force adds is the ability to use support attacks, or switch characters. On paper, that sounds great. My Hero One’s Justice is a great game with some cool combo mechanics, and expanding that from a 1v1 to a tag fighter sounds stellar. Unfortunately Jump Force fumbles in almost every way. First of all, it’s almost impossible to keep track of the action in Jump Force. The whole thing is simply drowning in motion blur, making even basic actions like trying to get into striking range more guesswork than it ever should be. Of course, visibility issues are compounded by all the other visual flair, with attacks creating all sorts of colorful flourishes and particle effects. That’s fine and appropriate for the source material, but again most of the time when things are popping off, it’s difficult to parse what’s actually happening on the screen. Even worse, the actual combo mechanics do an awful job communicating what the characters are even capable of. The light and heavy combos are basically pre-determined auto-combos that end in knockdown states, regardless of which one you choose. You can cancel into a special ability after a couple of hits, but there isn’t any indication of more than that. In my experience playing Jump Force and trying to experiment with my fighting game brain, the best I could consistently come up with was hit confirming into a special or super, and maybe swapping out my character if I felt like it. Your team shares a health bar, so it doesn’t really matter if you bother or not. In comparison, My Hero One’s Justice does a lot of legwork in communicating to the player what you can do, and what your limitations are. Different attacks are color-coded, which helps convey to the player what the can and can’t link together to make their combos happen. There are clear rules, and clear opportunities to make use of them. In Jump Force, while defending yourself with guarding, dodging and countering feels good and makes sense, the offense part feels like flailing around in the dark. Ultimately, it seems pointless to have a set of three specials for tangible gameplay reasons. I was really hopeful in the lead up to Jump Force, because I love most of these characters, and the set dressing for the concept is often very cool. The visual style was even something I thought I was getting used to as the character reveals rolled in. But once the game was in my hands, reality struck me like a Detroit Smash and what I had before me was a mess. Jump Force is ugly, janky, confusing, and far too simple. It does what other games have already done before, but with far less confidence or success. It tries to hide its misgivings behind cool special moves and motion blur, but fails at that too. It’s a total swing and miss, but hopefully just a bump in the road for Shonen Jump games in the long run. Jump Force review code provided by publisher. Version 1.02 reviewed on a Standard PS4. For more information on scoring please see our Review Policy here.